Netflix said “Bird Box” was its biggest hit to date. It is a tale about a mysterious force that decimates the world’s population by driving people to suicide if their eyes are uncovered. The hero and her family seek sanctuary by taking a perilous journey down a treacherous river, blindfolded. For Canadian dollar traders, the movie has a lot of parallels to the current trading environment, except their river is a creek and the canoe doesn’t have a paddle. The year isn’t even three weeks old, and a host of potential global macro and geopolitical risks are circling markets like a wolf pack on a wounded wapiti. Issues flare, headlines blare and currencies careen everywhere. The Canadian dollar has not been unscathed. It has rallied and plunged because of domestic and international developments and began the year staring into the abyss. It was on the verge of an accelerated plunge toward 70 cents against the US dollar between Christmas and January 3, as traders digested Jerome Powell’s comments from the December 19 post-FOMC press conference. That’s when Mr Powell suggested that the Fed was on “auto-pilot” and appeared oblivious to global equity market chaos. Then Apple CEO Tim Cook sent a letter to investors which essentially said that it slashed its revenue forecast because of US/China trade tensions. Equity markets tanked further and the year started on a sour note. Then the storm clouds parted, and the sun shone down. Oil prices surged, China and the US reconvened trade talks, and Jerome Powell changed his tune. Robust domestic and American employment reports dashed fears of an imminent economic slowdown. Traders unwound safe-haven trades and flocked to riskier assets. The Loonie flapped its wings, found a thermal and wafted higher. The thermal came in the form of a sharply narrower price gap between Alberta’s Western Canada Select (WCS) crude and the North American benchmark crude, West Texas Intermediate. (WTI). When the Bank of Canada (BoC) issued the quarterly Monetary Policy Report on January 9, they warned that the drop in oil prices could shave about 0.5% of Canada GDP by the end of 2020. 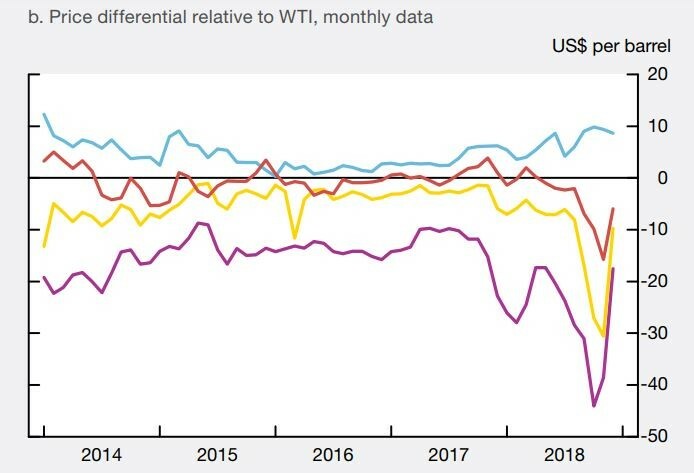 If oil prices continue their current trajectory while the WCS discount remains where it is, the forecast GDP decline may be too pessimistic. WTI was $49.53/barrel on January 9 and was 5.3% higher on January 16. Prices could touch $63.40/ if the American’s and China reach a trade deal. However, the rally stalled when the Bank of Canada adopted a cautious, somewhat dovish approach to monetary policy. Mr Powell may have seen the light, which in Bird Box may not have been a good thing, but for financial markets, it was a bonanza. In a couple of speeches since January 4, the Fed Chair is preaching that he is “patient and flexible.” What he didn’t say was “sorry, I didn’t mean what you thought I said, in December.” Wall Street is buying what Mr Powell is selling. The Dow Jones Industrial Average (DJIA) has risen 11% since the FOMC meeting. The move got an added assist this week when the big American banks quarterly earnings reports surprised to the upside. China is promising fresh tax cuts for its corporates and citizens in another effort to boost economic growth. The promises boosted the benchmark Shanghai Shenzhen CSI 300 index. It has climbed steadily since the new year and is approaching its December peak. At the same time, the Chinese yuan gained 2.3% against the US dollar, rising 2.3%. The odds of a US/China trade deal improved following last week’s talks. They got even better when it was reported that Vice Premier Liu He will lead another trade delegation to Washington on January 30. That’s a lot of good news, but the specter of a macro or geopolitical calamity is haunting FX markets. Sterling is a good example. GBPUSD was caught like a deer in the headlights ahead of, and after the Brexit parliamentary vote and then the Labour-sponsored no-confidence vote on Theresa May’s government the next day. GBPUSD dropped from 1.2910 the day of the Brexit vote and touched 1.2670 immediately after the result was known. Since then prices have been in a very tight box, between 1.2800-1.2900. That won’t last and the next move could be nasty. Across the English Channel, EURUSD has chopped about in a 1.1350-1.1550 band for the past week. European Central Bank (ECB) President Mario Draghi warned that the Eurozone economy has weakened unexpectantly and said Brexit and trade tensions could undermine the recovery. The US government shutdown is another issue. The closure impacts the availability of economic data. FX liquidity may suffer as the lack of data sidelines fundamental traders. Even when the data gets issued, the accuracy of the numbers will be questionable and subject to revisions. Senior BoC Deputy Governor Carolyn Wilkins gives a speech on January 31, and the next BoC policy meeting isn’t until March 6. Meanwhile, Brexit news, Eurozone developments, trade talks and oil price swings will drive US dollar sentiment, leaving Canadian dollar traders to navigate the creek while peaking through a blindfold.